Our first day of surveying intertidal habitats on the Farallon Islands was cold and wet, with gusty winds practically blowing us over while we set out our sampling plots. The Farallones, 29 miles west of the Golden Gate Bridge in San Francisco, are a desolate cluster of seven small rocky outcrops sometimes dubbed the “Devil’s Teeth,” but other times referred to as “California’s Galapagos.” The jagged rocks are barely visible over the western horizon from the Golden Gate, but on a clear day can be seen from the more northerly Point Bonita lighthouse as gray spikes poking through an otherwise flat and expansive sea surface. Looking closer, the rocky islands are covered with low lying vegetation, have abundant bird and marine mammal colonies, and the rocky margins are rich with a wide array of marine plants and animals. 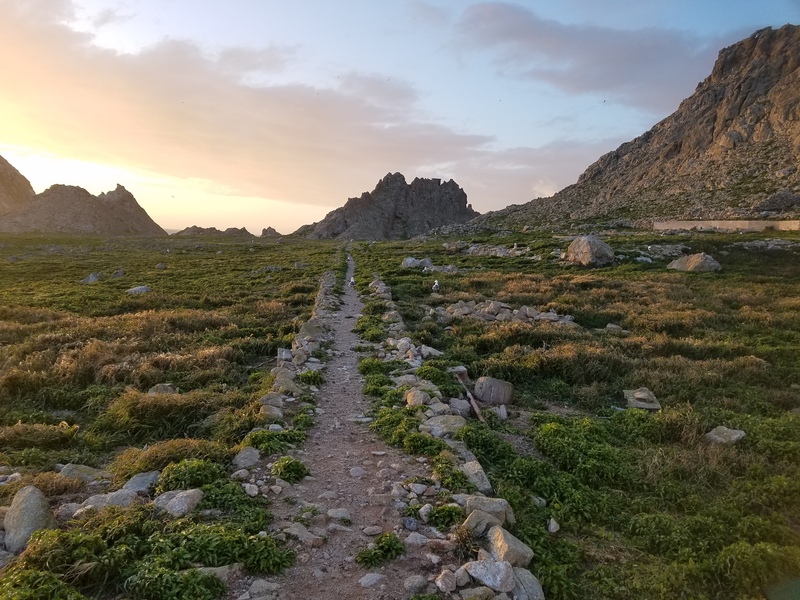 Our survey team’s task for the week was to establish and inventory several new standard plots (or “quadrats”) and line transects within the rocky land-water interface. Once we selected and carefully marked the plots, we got down on our hands and knees to identify and catalog the wide variety of plant and animal species that thrive in the dynamic intertidal environment. 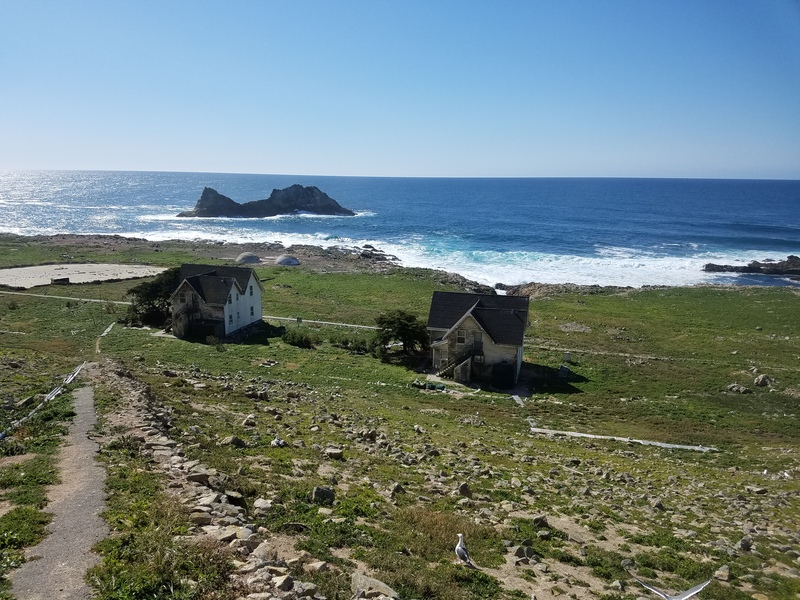 Scientists have surveyed the rocky intertidal zone on South Farallon Island since at least 1990, and as we selected new spots for monitoring, we saw the epoxy markers of past studies. Continuity of monitoring is important, but so is consistency with monitoring methods and protocols used by multiple collaborating research organizations across broad geographic regions like the entire West Coast of the U.S. In 1999, the Partnership for Interdisciplinary Studies of Coastal Oceans (PISCO) initiated long-term and large-scale studies to understand the functioning of the coastal marine ecosystem along the U.S. West Coast. Rocky intertidal communities in particular are studied at hundreds of sites following methods developed by the Multi-Agency Rocky Intertidal Network (MARINe). 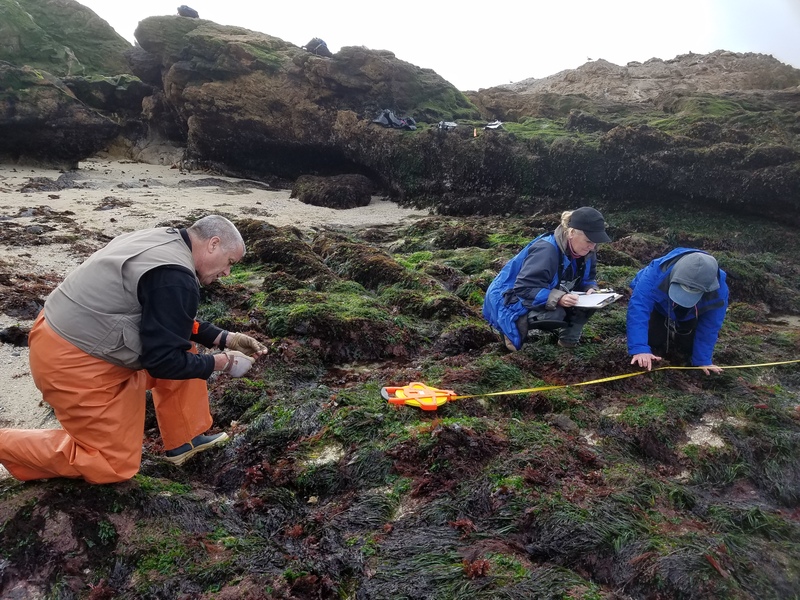 Updating the shoreline monitoring on the Farallones to be consistent with the protocols of the MARINe monitoring system is what brought our four-person team to the island last December and more recently in February 2018. 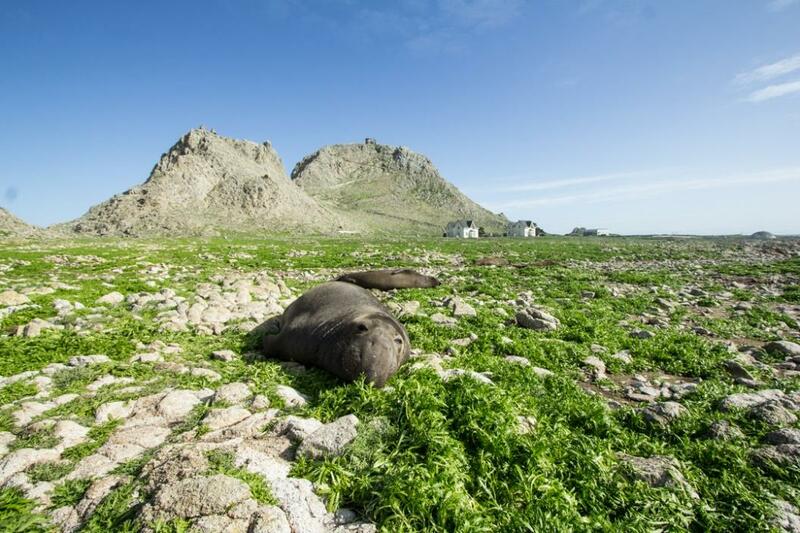 Natalie Cosentino-Manning, Rob Ricker, Greg Baker, and Jan Roletto at Dead Sea Lion Flat on South Farallon Island. The object in the middle is a quadrat used for systematically counting organisms. Image credit: NOAA. The Farallones are the namesake of a massive ancient seafloor plate, called the Farallon Plate, which disappeared long ago, subducted beneath the western United States across tens of millions of years. 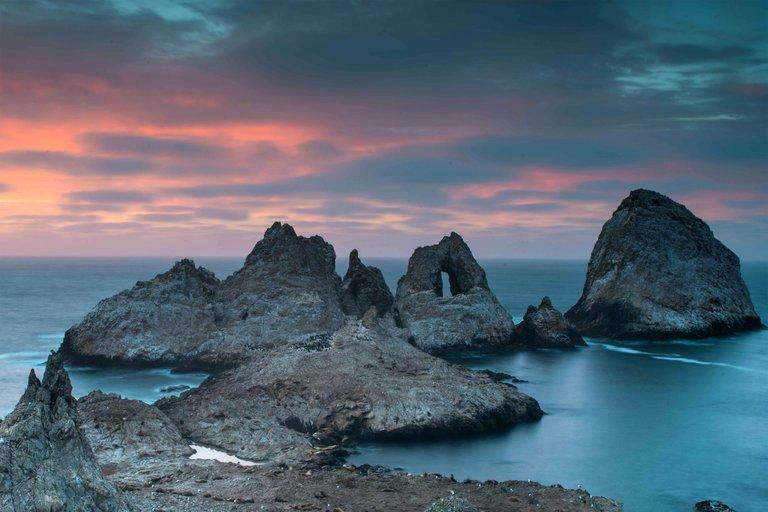 They are situated within NOAA’s Greater Farallones National Marine Sanctuary (GFNMS), an expanse of the Pacific Ocean set aside to protect important natural and cultural places. Our survey team was led by Jan Roletto, research coordinator for the GFNMS. Rounding out our NOAA field team were Natalie Cosentino-Manning of the NOAA Fisheries Restoration Center, and Rob Ricker and Greg Baker of the NOAA Oceans Assessment and Restoration Division. 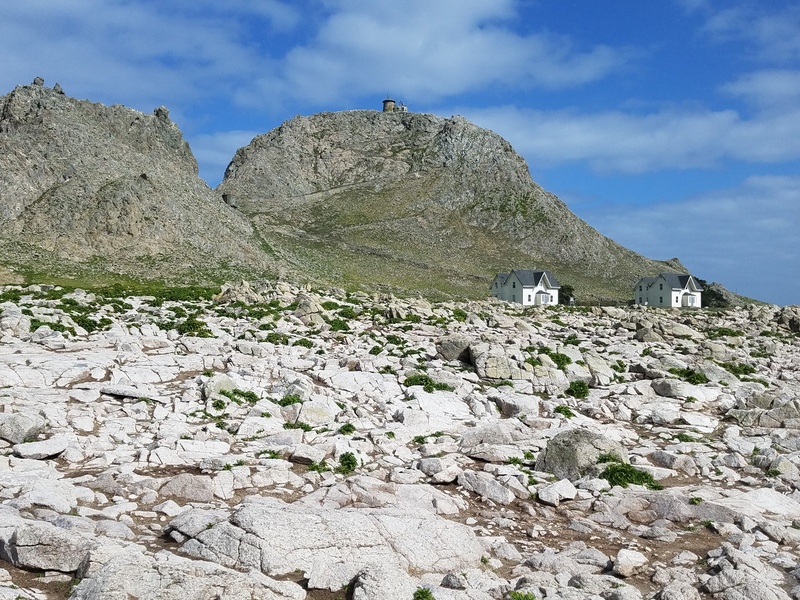 The team selected monitoring sites that reasonably represent surrounding biological communities and contain a predominance of certain key species such as mussels (Mytilus) or the short and scrubby turfweed (Endocladia). Once identified, the precise locations and orientations of rectangular plots and line transects were documented in multiple ways. 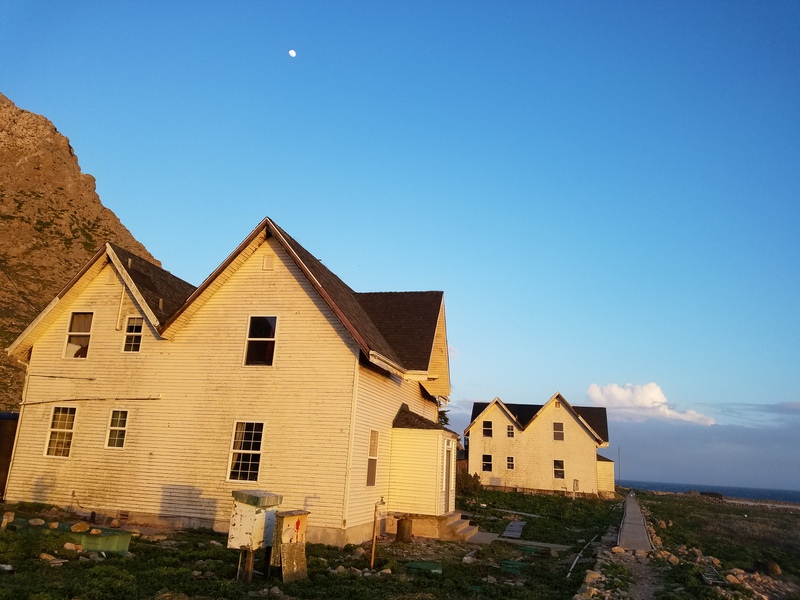 The team recorded GPS readings for each plot and transect, along with noting the location of a panoramic overview from which the team photographed the overall layout. The team also applied a tablespoon-sized dollop of epoxy to the rocky substrate at each corner or end of a plot or transect. Small zinc washers were embedded in the epoxy to enable the use of metal detectors to relocate markers, which may become hidden over time by fast growing plants or shellfish. Furthermore, measuring tapes and a compass were used to record the distance and direction from the overview point to each epoxy marker. These careful steps will ensure that future monitoring teams will be able to reacquire the exact survey spots and reassess the abundance and diversity of species to accurately follow the fluctuations in intertidal communities that may be caused by changing climate or human impacts such as oil spills or marine debris. Working in the rocky intertidal has many challenges and rewards. As commonly said, the sea waits for no-one; rising and falling tides limit marine biologists to short periods of time to complete their surveys. Our teams conducted intertidal surveys within a three-hour window each day when the tide would fall to its lowest daily point. 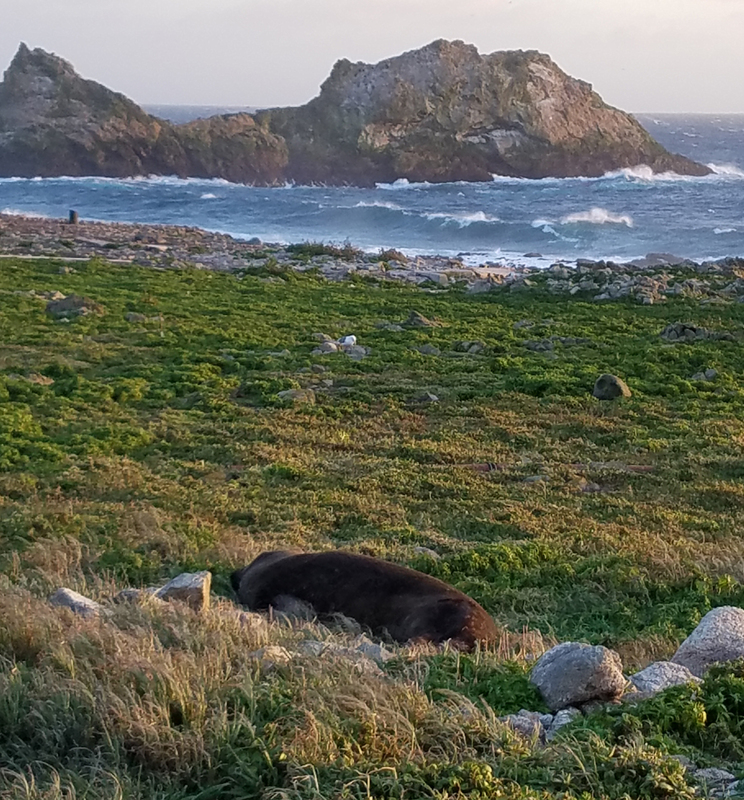 We also had to account for delays caused by weather and allow time for avoiding or minimizing disturbances to the many marine mammals like seals, sea lions, and elephant seals that frequent the shores of the Farallones. Though we had preparations and follow-up to do, we also had time to explore the island during the day, and discuss what we found with other wildlife biologists stationed on the island for weeks and months at a time. Above the water line the Farallones are a designated National Wildlife Refuge and host the largest seabird nesting colony in the lower 48 states. Hundreds of thousands of Common Murres blanket South Farallon Island’s eastern slopes. Hundreds of curious seals and sea lions were common observers during our rocky intertidal work – waiting impatiently for us to finish our sampling and allow them to re-occupy their haul outs. We saw passing whales but did not see any great white sharks; the Farallones are notorious as a major feeding ground for the great whites. 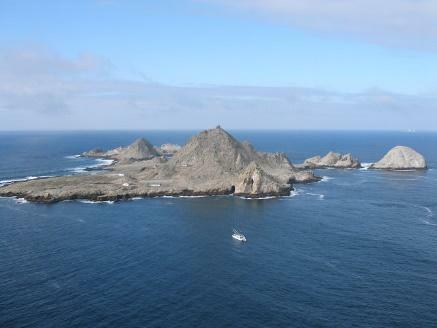 The uniqueness and the richness of the Farallones lies in how seemingly remote they are, though not immune to the effects of environmental disaster — as happened when the tanker Puerto Rican exploded outside of San Francisco Bay in 1984 and caused a massive oil spill that hit the islands. 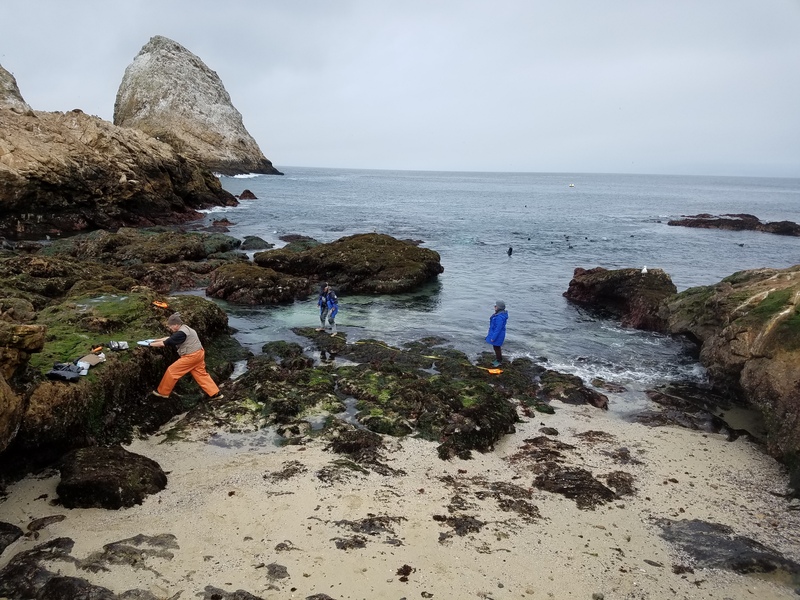 By collecting baseline biological data from locations such as the Farallones, we are better prepared for future incidents and can use this data through the response, assessment, and restoration phases to keep and return the intertidal area to its natural state. These surveys would not be possible without collaboration through partnerships with various groups within NOAA and academic institutions. These partnerships unite people focused on basic research and give them a platform for practical applications of science, such as the settling of NRDA (natural resource damage assessment) claims. Rob Ricker, Jan Roletto, Natalie Cosentino-Manning, and Greg Baker. Image credit: NOAA. Great article, really unique place. How did you you make out with the mice?